A new town in Hart District, whether in Winchfield or anywhere else, will open up Hart to be a sink for 3,100 overflow houses from Surrey Heath and Rushmoor Borough Councils. Yet Hart District Council’s strategy for the Local Plan has set us on the path for a new town which makes this inevitable and will destroy our green fields and wildlife habitats and clog up all of our infrastructure. If you disagree with this strategy please sign the We Love Hart (We ♥ Hart) petition. The Strategic Housing Market Assessment (SHMA), calls for Hart to build a total of around 7,500 houses in the district up to 2031. Our neighbouring districts, Surrey Heath and Rushmoor also have demanding targets and are saying that they cannot build all of their own allocation in their districts. 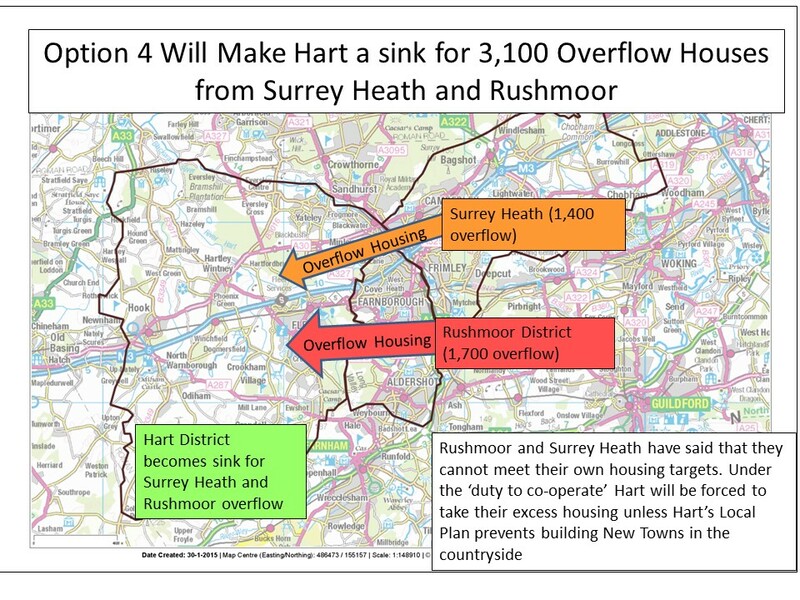 So, they want to pass over an extra 3,100 or so houses (1,700 from Rushmoor and 1,400 from Surrey Heath) to Hart that will push our target up to around 10,600 houses. See answers to questions here, page 17. In their housing options paper the council says that we would need to deliver 1,800-2,400 houses on a new settlement (Option 4). However, the Barratts New Town proposal document says that such a new settlement would have capacity for 5,000 houses, more than twice the size of Elvetham Heath, and could start building as early as 2017. This leaves a convenient surplus of around 3,000 dwellings in the new settlement that could be used to fill the shortfall from Surrey Heath and Rushmoor. The We Heart Hart campaign believes this is a grave strategic error on the part of Hart Council because they are following a policy that means there is a real risk we will have to build even more houses in Hart and concrete over our green fields. Massive increase in congestion throughout all of the district. Coalescence of Fleet, Church Crookham, Crookham Village, Dogmersfield, Winchfield, Hartley Wintney, North Warnborough and Odiham into a giant conurbation. Posted in Congestion, Environment & Ecology, Hampshire, Hart District Council, Hart Local Plan, Hart SHMA, Infrastructure Costs, Risk of becoming sink for Surrey Heath and Rushmoor, We ♥ Hart Campaign, We Heart Hart Campaign, We Love Hart Campaign and tagged Church Crookham, Environment & ecology, Fleet, Hartley Wintney, Hook, North Warnborough, Odiham, Risk of becoming sink for Surrey Heath and Rushmoor, Rushmoor Borough Council, SHMA, Surrey Heath Borough Council, We ♥ Hart Campaign, We Heart Hart Campaign, We Love Hart Campaign, Winchfield. ← Only 700 houses on Brownfield land?